Showing all 41 items matching your search criteria. 122. 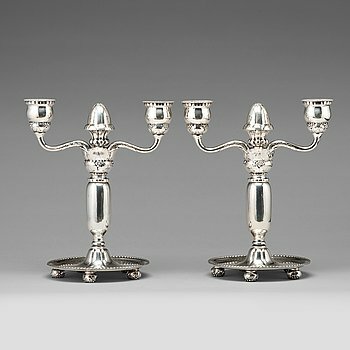 Georg Jensen, a pair of 830/1000 silver two light candelabra, Copenhagen 1918, model nr 93. 123. Georg Jensen, a 830/1000 silver bowl, Copenhagen 1920, design nr 197. 124. Georg Jensen, a shoehorn and a tool for tying shoe laces, Copenhagen ca 1918-20, 830/ 1000 silver. 125. 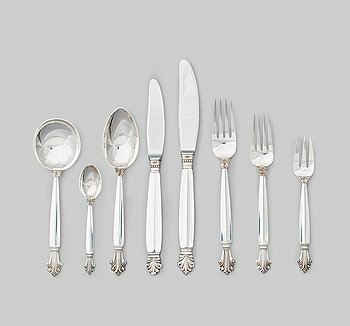 Johan Rohde, a set of 85 pieces of "Acorn" flatware, Georg Jensen, Copenhagen 1925-1975, silver and stainless steel. 126. 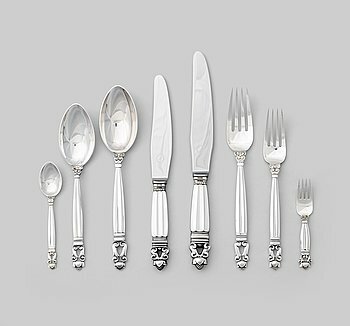 Johan Rohde, a set of 94 pieces of "Acanthus" sterling and stainless steel flatware, Georg Jensen, Copenhagen post 1945. 127. 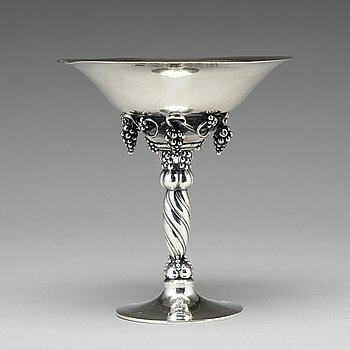 Georg Jensen, a silver grape bowl, executed in Copenhagen 1920, model 263. 128. 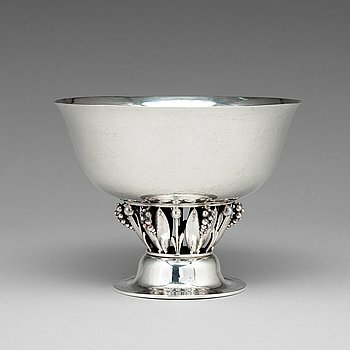 Georg Jensen, a sterling bowl, Copenhagen, executed 1925-32, design nr 263A. 129. 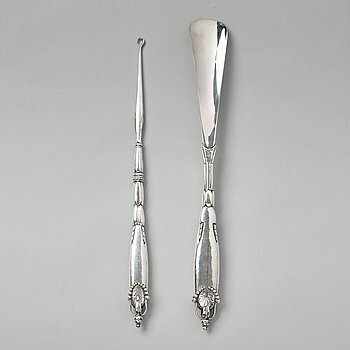 Johan Rohde, a set of 83 pieces of "Acorn" sterling and stainless steel flatware, Georg Jensen, Copenhagen post 1945. 130. 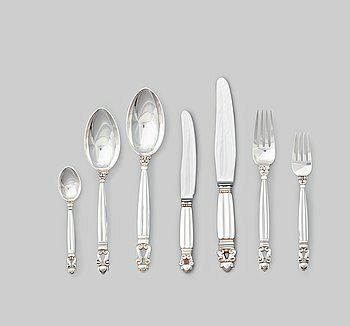 Harald Nielsen, a set of 61 pieces of "Pyramid" flatware, executed by Georg Jensen, Copenhagen ca 1927-1977, 830/1000, sterling. 131. Harald Nielsen, a pair of "Pyramid" sterling candlesticks, Georg Jensen, Copenhagen, post 1945, model nr 747A. 132. NANNA & JØRGEN DITZEL, a mid 20th century sterling necklace, Anton Michelsen, Denmark. 133. 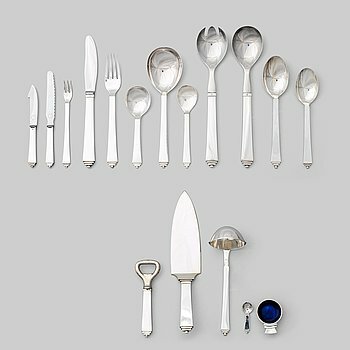 Tias Eckhoff, TIAS ECKHOFF, a set of 99 pieces of "Cypress" sterling and stainless steel flatware by Georg Jensen, Danmark, post 1952. 134. Tapio Wirkkala, a "TW412" sterling candelabrum for thirteen lights, executed by Hopeakeskus OY, Finland post 1968. 135. Tapio Wirkkala, a set of twelve pieces of sterling, a pitcher, ten beakers and a tray, Kultakeskus Finland 1975-79. 136. Björn Weckström, a necklace "Flowering wall", Lapponia 1968, 18K gold, pendant with pearls. 137. Björn Weckström, a necklace with pendant, "Rain in the mountains", Lapponia, Finland 1992, 18k. 138. Hugo Lundstedt, a silver and enamel Art Nouveau jewelry casket, Gothenburg 1911. 139. A pair of W.A. Bolin silver candelabra for three lights, Stockholm 1955. 140. Vivianna Torun Bülow-Hübe, a silver necklace with two pendants, Stockholm 1952. 141. Sigurd Persson, a sterling necklace, Stockholm 1965. 142. Sigurd Persson, a sterling bowl in two parts, executed by the silversmith Johann Wist, Stockholm 1969. 143. 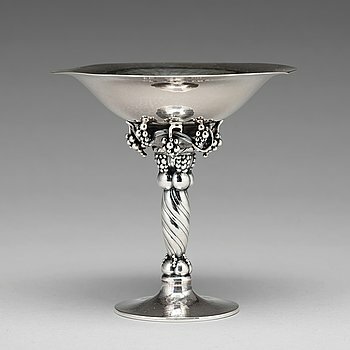 Wiwen Nilsson, a silver bowl, executed in Lund, Sweden, 1929. 144. Wiwen Nilsson, a pair of candlesticks, Lund 1943, sterling. 145. Wiwen Nilsson, a sterling cocktail shaker, Lund 1960. 146. Wiwen Nilsson, a sterling and rock crystal necklace with pendant, executed in Lund, Sweden 1947. 147. Wiwen Nilsson, a sterling so called "gürtel" necklace, Lund Sweden 1949. 148. Wiwen Nilsson, two sterling "gürtel" bracelets, Lund 1949, -61. 149. Wiwen Nilsson, a pair of sterling candlesticks, Lund 1964 and 1968. 150. Wiwen Nilsson, an 18k gold bangle with a facet cut amethyst, Lund 1968. 150A. Wiwen Nilsson, an 18k gold ring with a facet cut rock crystal, Lund 1962. 151. Wiwen Nilsson, an 18 k white gold ring with a facet cut turmaline, Lund 1958. 152. Wiwen Nilsson, an 18k gold necklace, executed in Lund Sweden 1961. 153. Wiwen Nilsson, an 18 k gold bracelet, executed in Lund Sweden 1947. 154. Wiwen Nilsson, a pair of sterling candlesticks, Lund 1948. 155. Wiwen Nilsson, an 18k gold necklace, Lund, Sweden 1974. 156. Wiwen Nilsson, an 18 k gold bracelet, Lund, Sweden 1965. 156A. Wiwen Nilsson, a sterling and rock crystal necklace with pendant, executed in Lund, Sweden 1941. 157. An Atelier Borgila sterling bowl, Stockholm 1966. 158. Claës Giertta, a set of three sterling candlesticks, Stockholm 1969. 159. Karl-Heinz Sauer, a sterling teapot, Västerås, Sweden 1986. 160. Inga Lagervall Ringbom, a jaspis and sterling necklace, Stockholm 2003.